Gloucester, 8 March 2017: Specialist composite panel contractor ISD Solutions has completed the fit out of new high care production facilities for Rhokett, the rapidly expanding luxury high volume dessert maker, which supplies big-name customers including Marks and Spencer, Waitrose, Pret A Manger and Sainsbury’s. 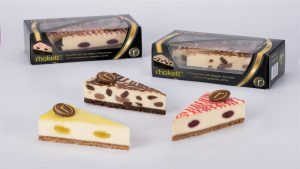 The new 1410m² food processing centre at Cranbrook in Kent will provide Rhokett with further capacity to match high levels of demand for its upmarket cheesecake and patisserie range. Rhokett was established in 2002 with the support of Michelin-star chef Gary Rhodes and is currently seeing a growth of more than 20% a year. To meet extremely high food safety standards the team worked side by side with Rhokett to deliver a temperature controlled clean room type installation with minimal ledges, flush walls and where possible fixing free. The construction includes a total of 2,200m2 100mm PIR (Polyisocyanurate) panels with a food safe laminate skin to form the walls and ceilings, with bespoke trims and detailing around columns, alcoves, doors, stairs and lifts as well as ovens, chillers and freezers. Services, as well as plumbing for eight sink stations, are cleverly concealed within the panel core. Approximately 95% of fittings and finishes were designed and manufactured by ISD Solutions’ in-house team ensuring greater accuracy, flexibility to meet client requirements and high quality for the 12-week project.